There is nothing better than picking a fresh strawberry, dipping it in a bowl full of sugar and enjoying. 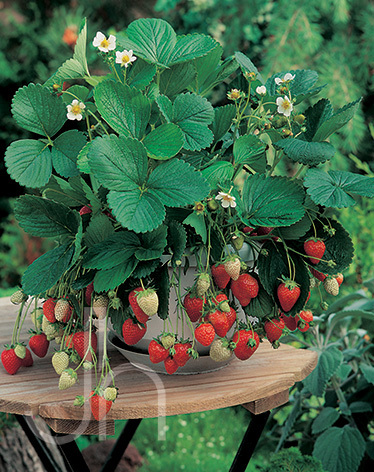 Berri Basket Everbearing Strawberries produce large red berries on compact, bushy plants. The compact habit makes this variety great for hanging baskets so you can have fresh strawberries on your porch or patio. Be sure that your basket or planter gets 6 hours or more of direct sunlight. The white flowers stand out on the shiny green foliage making these plants attractive as well as a good source for fruit. Make no mistake, they perform well in the garden also. Outstanding features: Berries ripen about 30 days after first bloom. For the best-tasting berry, pick them a day or two after the whole berry turns red. Remove all ripe berries because overripe, rotting fruit will encourage diseases and insects. Tips: Make sure the plants are well watered for the first two weeks after planting. Ever-bearer strawberries need 1 to 1½ inches of water a week. Soaker hoses or trickle irrigation is best for Strawberries because they keep water off the foliage, which helps prevent problems such as gray mold. The amount of fertilizer your plants need depends on the fertility of your soil and the health of your plants. Mulch to keep down weeds. Try to keep evenly moist and watch for signs of wilt. Click here to buy Berri Basket Strawberries direct from www.buygardenvegetables.com.